Thanks to generous support from the Nestlé Purina PetCare Company, future veterinarians are getting the training they need to make a difference in the lives of homeless animals! Maddie’s® Shelter Medicine Program has partnered with Nestlé Purina to provide scholarships for talented veterinary students seeking to complete our Online Graduate Certificate in Shelter Medicine. The recipient of the Nestlé Purina Scholarship for the spring semester is Abby Patterson, a third-year veterinary student at Colorado State University. Abby is currently enrolled in our Shelter Animal Behavior and Welfare course, one of three courses that compose the Online Graduate Certificate. Read about Nestlé Purina’s involvement in shelter programs. Hello! My name is Abby Patterson, and I am a third year vet student at Colorado State University. I am honored to be a recipient of one of the Nestle-Purina scholarships. I am currently in the “Shelter Animal Behavior and Welfare” course, and I have already completed the “Integrating Veterinary Medicine with Shelter Systems” course. I have always wanted to be a vet, but I didn’t discover the opportunities in shelter medicine until after undergad. 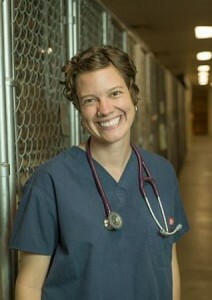 I felt drawn to the specialty because it offered help to one of the most vulnerable animal populations; it combined my interests of working towards the greater good in the community and public health; and it was profession where I felt like I could make a difference improving the lives of un-homed animals every day. The education and knowledge I have gained from the University of Florida Maddie’s Online Shelter Medicine Certificate courses has been immensely valuable. These courses offer a perfect supplement to my veterinary medical education by building on the individualized animal medical framework with shelter specific concerns. To have access and learn from some of the leaders in shelter medicine is amazing! Because of these courses, I feel I will be able to enter the shelter medicine world with practical and the most recent knowledge so I can truly bring my best to the profession and the animals. Thanks so very much for allowing me this opportunity!